AbsoluteShield Internet Eraser Lite contains a pop-up blocker and a privacy protector. AbsoluteShield Internet Eraser Lite protects your privacy by cleaning up the tracks of your Internet and computer activities. It can erase the browser cache, history, cookies, typed URLs, recycle bin, temp folders and much more in one click. Also included comes a automatic popup blocker. Beside the ability to erase the tracks of your Internet and computer activities, the tool also has an integrated, small, configurable and intelligent Ad window and popup blocker. AbsoluteShield Internet Eraser supports Internet Explorer, MSN, Netscape/Mozilla/FireFox, AOL and Opera. 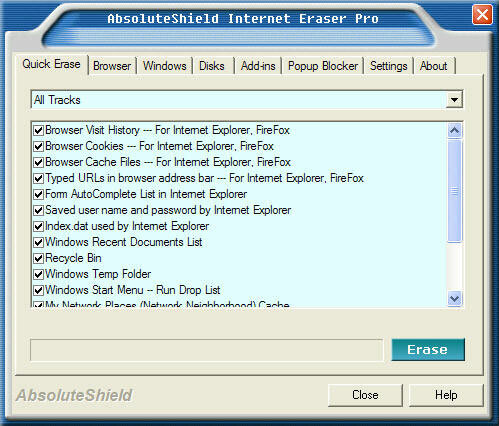 The latest version of AbsoluteShield Internet Eraser 4.11 now supports IE 8/FireFox 3.x and Windows 7 / Vista compatible. Why do you need AbsoluteShield Internet Eraser? Qweas is providing links to AbsoluteShield Internet Eraser Lite 4.11 as a courtesy, and makes no representations regarding AbsoluteShield Internet Eraser Lite or any other applications or any information related thereto. Any questions, complaints or claims regarding this application AbsoluteShield Internet Eraser Lite 4.11 must be directed to the appropriate software vendor. You may click the publisher link of AbsoluteShield Internet Eraser Lite on the top of this page to get more details about the vendor.